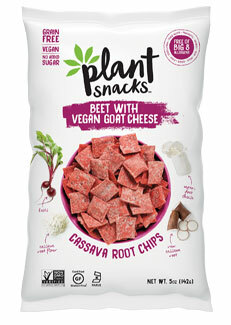 Plant Snacks was created with the purpose of making better snacks than what have been currently available in stores, and they've succeeded beyond expectation with these delicious vegan goat cheese chips that are 100% dairy-free and 100% addicting! Tired of artificial flavors, cheap ingredients, and poor nutrition? Look no further, because you won't find any of those problems with Plant Snacks Vegan Cheddar chips - they're made with healthy and tasty cassava root flour as the base ingredient because it's naturally grain-free, gluten-free, and nut-free, and is sustainbly grown and harvested in Brazil. Beside being a great base for a delectably crunchy chip, cassava flour is free of the big 8 allergens, is non-GMO certified, and has no added sugar, giving you superior snacking nutrition in every handful. Made with the best pure and simple ingredients, each bag is packed full of awesome cheesy, crunchy goodness that you and your family can feel great about eating when it comes to snack time. 5 oz. (142g) bags are $3.99 each. From Richard Rankin of Kirksville, Missouri on 7/17/2018 . I was skeptical about these chips, but they really deliver. The star is the vegan goat cheese, but it makes these chips very special.